Now KJS is using new online system to process the manuscripts called OJS and it will assists with every stage of the refereed publishing process, from submission through to online publication and indexing. So you are invited to Register as "Author" and submit your manuscript into the online system by clicking here. 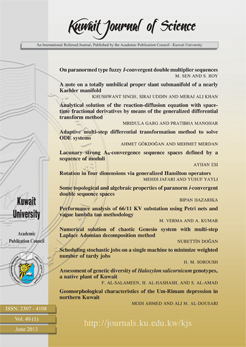 As a continuation of Kuwait Journal of Science and Engineering (KJSE, ISSN: 1024-8684), which has been in publication by the Academic Publication Council of Kuwait University since 1974, we are now publishing Kuwait Journal of Science (KJS) as an independent new Journal catering exclusively to a wide community of professionals in various disciplines of science. Kuwait Journal of Science (KJS) is indexed and abstracted by major publishing houses such as Chemical Abstract, Science Citation Index, Current contents, Mathematics Abstract, Micribiological Abstracts etc. KJS publishes peer-review articles in various fields of Science including Mathematics, Computer Science, Physics, Statistics, Biology, Chemistry and Earth & Environmental Sciences. In addition, it also aims to bring the results of scientific research carried out under a variety of intellectual traditions and organizations to the attention of specialized scholarly readership. As such, the publisher expects the submission of original manuscripts which contain analysis and solutions about important theoretical, empirical and normative issues. The Journal's Online system assists with every stage of the refereed publishing process, from submissions through to online publication and indexing. Through its management systems, its finely grained indexing of research, and the context it provides for research, Online System seeks to improve both the scholarly and public quality of refereed research. The Journal welcomes submission of scholarly work of science from professionals that meet the stipulated criteria with regard to significance, value and scientific excellence. We look forward to receiving your scholarly work for publication in KJS.